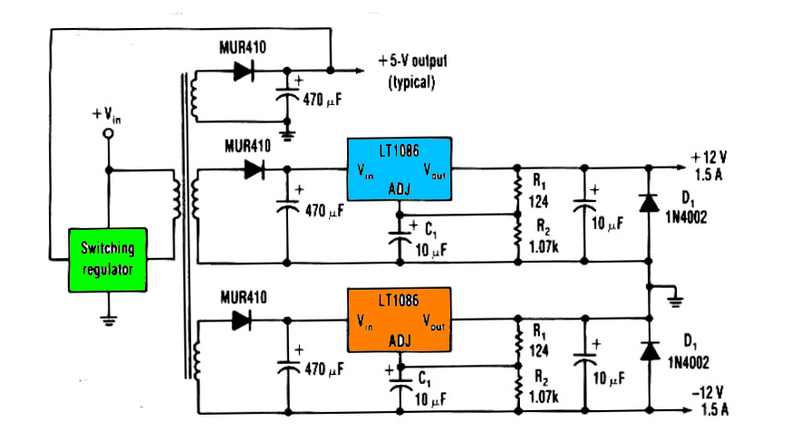 One way to provide good negative-voltage regulation is with a low-drop-out positive-voltage regulator operating from a well-isolated secondary winding of a switch-mode circuit transformer. The technique works with low-dropout types. Under all loading conditions , the minimum voltage difference between the regulator Vin and Vout pins must be at least 1.5V , IC LT1086 low-dropout voltage. If this requirement isn't met, the output falls out of regulation. Two programming resistors, R1 and R2, set the output voltage 12V, and the IC LT1086 servo the voltage between the output and its adjusting terminals to 1.25V. Capacitor C1 improves ripple rejection, and protection diode D1 eliminates common-load problems. 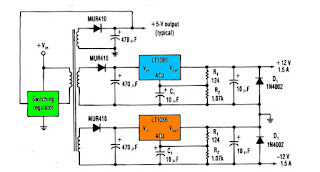 Since a secondary winding is galvanically isolated , a regulator 12V output can be referenced to ground. Therefore , in the case of a negative-voltage output , the positive-voltage terminal of the regulator connects to ground , and the 12V output comes off the anode of D1. The Vin terminal floats at 1.5V ore above ground.